Marz Community Brewing Company hosts Crafty as F*ck from noon to 4 p.m. on Sunday, December 9, 2018, at the Marz Community Brewing tap room, 3630 S. Iron St., Chicago. 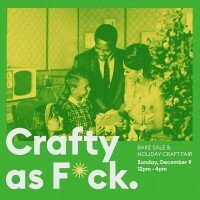 Equal parts crafts fair and bake sale, the event offers seasonal treats and holiday shopping from local artisans. Proceeds will benefit the Chicago Period Project.